The growth and expansion of Charlotte in the late nineteenth and early twentieth centuries were intimately bound up with the installation and development of its streetcar network. Streetcars initially appeared in Charlotte in January 1887, when a horse-drawn, later mule-drawn, system commenced operations. It was the Charlotte Consolidated Construction Company, locally known as the Four C’s, which truly revolutionized the transportation system of Charlotte, however. In February 1891, the Four C’s signed a $40,000 contract with the Edison Electric Company to construct an electric streetcar or trolley system. 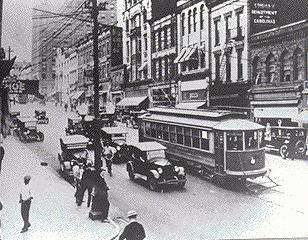 Work began in March and terminated on May 18, 1891, when the first trolley departed from Independence Square, the intersection of Trade and Tryon Streets in the heart of Charlotte. The system consisted of two lines, one from the Richmond and Danville Railroad Depot on W. Trade St. to McDowell St. on the eastern edge of the city and another from the Carolina Central Railroad Depot on N. Tryon St. to Latta Park in Dilworth, the streetcar suburb that the Four C’s opened on May 20, 1891. The accessibility of residential property to the trolley system became indispensable for successful real estate ventures in Charlotte after 1891. 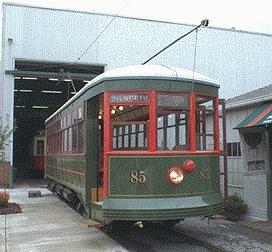 The initial expansion of the electric streetcar network occurred in September 1900, when a line opened which extended through Fourth Ward to Elmwood Cemetery on the western edge of the city. In May 1901, the Four C’s began service on a line which meandered through First Ward or the northeastern quadrant of Charlotte. In March 1902, trolleys initiated service to Piedmont Park, Charlotte’s second streetcar suburb. On December 13, 1902, the Charlotte Consolidated Construction Company opened a streetcar line that extended approximately three-fourths of a mile from the intersection of East Ave. (now East Trade St.) and McDowell St. along Elizabeth Ave. to a point three hundred feet west of the main building of Elizabeth Ave. (the present site of Presbyterian Hospital), thereby providing a powerful impetus for the growth of Elizabeth as an affluent residential district. The Elizabeth College streetcar line enhanced the prospects for real estate development in the surrounding countryside, including the farms along Providence Rd. Among the prominent residents of this area was J. S. Myers, whose farm contained about 1200 acres. In 1902, his daughter, Sophie, married George Stephens. This was to be a propitious union for Charlotte’s future. George Stephens was a talented, sensitive and gregarious human being. A native of Guilford Co., North Carolina, he entered the University of North Carolina in 1892, where he excelled as a student and as an athlete. Indeed, he was offered a contract as a professional baseball player because of his prowess as a pitcher. Stephens decided instead to move to Charlotte following his graduation in the mid-1890’s. Having written his senior thesis on the subject of road paving materials, he was attracted to Mecklenburg County because of its reputation for good roads. In 1899, Stephens joined with F. C. Abbott in establishing Abbott & Stephens, a real estate firm. In 1901, Stephens became president of the Piedmont Realty Company, the developers of Piedmont Park along the Central Ave. streetcar line. Also in 1901, he, Abbott, B. D. Heath, and Word H. Wood founded the Southern States Trust Company, later the American Trust Company, of which Stephens became president following F. C. Abbott’s withdrawal from the company in 1902. In 1905, George Stephens brought John Nolen (1869-1937), who was to become one of America’s premier landscape architects and comprehensive planners, to Charlotte to design Independence Park, the first public park in the City. Nolen was still a student in the School of Landscape Architecture at Harvard University. During his sojourn in Charlotte, Nolen commented that Stephens’s father-in-law, J. S. or “Jack” Myers, lived on a farm that had enormous potential as a residential development. It is reasonable to infer that this observation, coming as it did from such an impressive source, made a profound impression upon George Stephens. Jack Myers had long dreamed that his 1200-acre farm might become a fashionable residential development. However, he lacked the business skill necessary to achieve this objective. That was the ingredient which his talented, astute, and earnest son-in-law, George Stephens, was to provide. According to the Charlotte Evening Chronicle of December 30, 1911, the scope of Myers Park was “one of the biggest ever undertaken in this section of the South. “In residential developments of this character we get a good idea of what can be done by municipalities in beautifying the cities of the country,” John Nolen asserted. On March 13, 1912, the Charlotte Observer explained that Myers Park would be a “suburb of surpassing elegance and attractiveness.” This expectation would be fulfilled. Among the essential amenities of Myers Park was a streetcar line. Grading for the route was well underway by February 1912, and trolleys began serving the neighborhood on September 1, 1912. The Myers Park line branched off from the Elizabeth College line at the intersection of Elizabeth Ave. and what is now Hawthorne Ln., and extended southward into the suburb, entering Myers Park at the intersection of E. Fourth St. and Queens Rd. On August 29, 1912, the Charlotte Observer announced that the Stephens Company would erect a “combination gate and waiting station of singular beauty and lithic solidity” at the Queens Rd. entrance to the neighborhood. “This will be the handsomest waiting station on any car line in the South,” the Charlotte Observer asserted. The contractor, J. A. Gardner, brought granite from Winnsboro, S. C. for the job. The waiting station and the entrance gate were completed by late September or early October 1912. The waiting station at the intersection of Queens Rd. and Hermitage Rd. was erected soon thereafter. One cannot definitively attribute these structures to John Nolen. However, logic suggests that he would have designed landscape features of this order of magnitude. In the opinion of the Charlotte Observer, the entrance gate and waiting stations typified the elegance of Myers Park. “The expenditure of money which the Stephens Company is putting into this feature, largely ornamental, is an illustration of the care which is being taken to secure artistic finish in every detail,” the newspaper contended. Myers Park prospered. 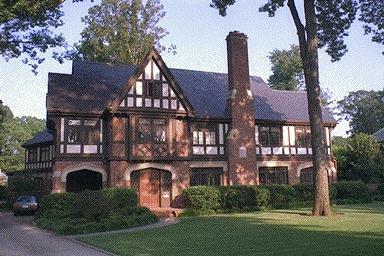 John Nolen sent landscape architects to Charlotte to prepare site plans for the purchasers of lots in the neighborhood. The Stephens Company provided this service, thereby underscoring its commitment to excellence in superintending its streetcar suburb. In 1915, Earle Sumner Draper, an associate of Nolen’s, located in Charlotte and oversaw the planting of trees along the curvilinear streets of Myers Park. Draper would go on to fashion the layout of such important local neighborhoods as Eastover and Rosemont. George Stephens resigned as president of the Stephens Company in July 1922 and moved to Asheville, N. C. Streetcar service to Myers Park and Charlotte as a whole ended on March 12, 1938. Sometime thereafter, the imposing entrance gate to Myers Park was demolished strictly for the convenience of automobiles – a not uncommon occurrence in the developmental history of Charlotte. Happily, the waiting stations on either side of the entry to the neighborhood and the one at Queens Rd. and Hermitage Rd. survive.